Life is full of ironies. For instance, I am scared to death of heights especially when climbing steps or when i'm in roller coaster but i lovee the thought of flying or riding a ferris wheel. Who would have thought that it has been my life long dream to be able to ride a hot air balloon? Although, I've never done this yet, I content myself by watching a dozen of colorful hot air balloons fill up the sunset sky last year at the Clark Aviation Field. 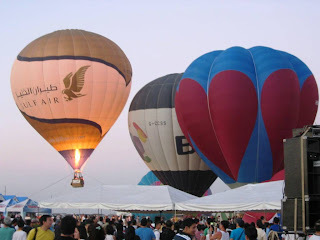 It’s going to be another year of fun, flare and flight at the 12th Philippine International Hot Air Balloon Fiesta! Happening on February 7-10, 2008 at Clark Economic Zone. Watch out for more details.